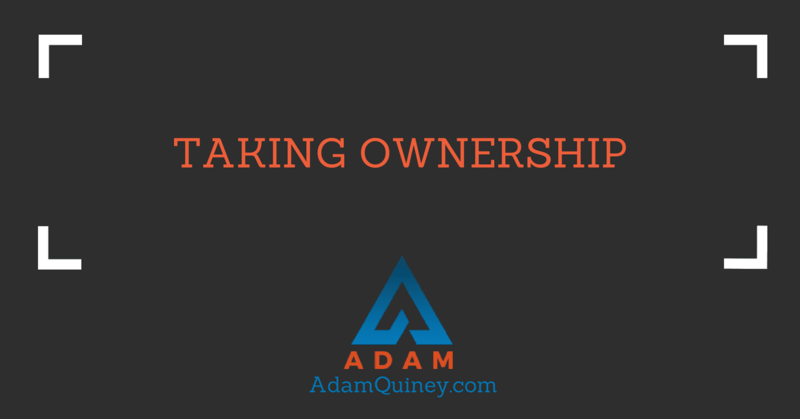 There’s a funny thing people to do to avoid taking ownership. These things are subtle, and they don’t really matter to me personally. I mean, they do, in as much as I get pissed off when people don’t take ownership for their lives, but that’s really more about me than it is about them. That’s about my stories of what is acceptable and the judgments I hold about myself, projected outwards onto other people. The issue isn’t really about me. It’s about people show up in their lives, and the impact of the way they’re showing up. The only time it really needs to have an impact on me is when I’m standing for their leadership. In those cases, my job is to reflect this stuff for them, and stand for them to do something else. In those other situations, my job is to work myself out so I can get back to being grounded in myself (instead of in my judgment). One of the biggest barriers to ownership in this context is filtering things through a right/wrong, blame-based context. When things go well, you must ensure that you get the credit for that. When things go bad, you’re a worthless piece of crap and you need to either pay penance or ship the blame elsewhere. This is an insidious context, because it is pervasive and will get in the way of you owning your life, time and again. It’s doubly-challenging, because many of us have this (as did our parents, and their parents), and so we tend to project this onto other people as well. The result is that there’s a lot of blame being handed out, and that creates a pretty compelling reason to ship responsibility elsewhere. As long as you have to ship responsibility elsewhere, you can’t take full responsibility for anything, and so this context tends to rule your life. You can never really be a full owner. At best, you get to own the way your life goes, but that makes you a blame-worthy piece of poo (which is a pretty heavy burden to carry around). At worst, it’s everyone else’s fault, and you can’t do anything about it. Rather than to be the one to blame for something, it’s easier to avoid responsibility. The challenging part here is not to avoid taking responsibility, nor to demand that someone else shift their relationship to it (“Look, I’ll take responsibility, but only if they’re willing to stop blaming me for it”). It would be great if other people would just take this on for us, but that’s still putting you as a victim to them. Instead, the deep work is noticing when you’re attaching blame to your responsibility, and practising letting go of that, regardless of what other people think. This requires a willingness to grant yourself total amnesty (complete forgiveness), so that you can really take a look at what you created. Not from blame, but from ownership. This becomes a lifelong practice — noticing where you are avoiding responsibility, or attaching blame to it, and then opening, unfolding, and leaning in to these areas of your life. Noticing the impact of the way you showed up, seeing the breakdown that’s caused, taking ownership for it, and then doing whatever is necessary to clean up, and prevent this from happening in the future. The other side of this coin is where people fall on their sword and repudiate themselves for what they’ve done, as a substitute for taking responsibility. On the surface, it looks similar. You point to what they’ve done, and they acknowledge it quickly: “I know, I know. I totally did that. I’m SOOOOO sorry. I’m awful. I always do this. I’m really sorry, it won’t happen again”. In this case, people are wallowing in their blame to such an extent that they’ve opted to flagellate themselves before you do. At least if they’re the ones doing the whipping, they know when the sting comes and can control the pain they feel, to a certain extent. This isn’t taking responsibility. This is whipping yourself. This doesn’t work for leadership. It gets in the way of leadership. It gives the leaders something else that they have to manage (your self-hate and flagellation) before they can actually move on and do the work that is here to be done. Falling on your own sword is generally about self-administering the inevitable punishment as quickly you can, so that you can then move off of it and get back to the point where you’re okay (as a human being). That need to speed away actually blocks your leadership. All of that flailing around on the end of your weapon prevents you from really taking a look at what you’ve created. It substitutes self-punishment and self-hate for true responsibility. It substitutes you relating to yourself as a piece of garbage for genuinely taking a look and understanding the impact you’re having. No one is really interested in your self-loathing. What we’re interested in is developing your leadership, and that requires you getting present to your impact, seeing how you created this, and putting steps in place to ensure this doesn’t happen in the future. No blame, no self-flagellation. Just addressing the breakdowns and moving things forward.